Hello and welcome to my home page. 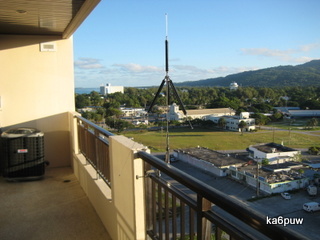 Antenna: The HF antenna is a four element monoband yagi,and a multi-band trap vertical. 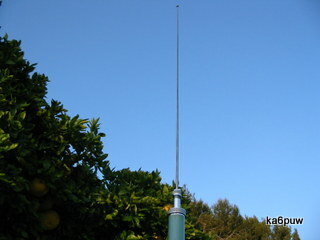 The VHF antenna is a two meter yagi and the UHF is a 10 element 440 yagi. Lets support the new Technician Class HF enhancements when the FCC asks for comments. Kure Island and Midway Island are back on the DXCC list! Cycle 24 is coming to an end. There are some reports that New sunspots are appearing for Cycle 25 in December. Bad news is that the Sunspot Magnetic Field Strengths have been declining since Cycle 23. Current predictions are that Cycle 25 will peak around 2022. Interesting ATO fuse adaptor. I ordered some for my car. The reason for 2 fuses is because if you are replacing a fuse position you take the original fuse out and put in the yellow position. The green fuse is for the device your protecting. 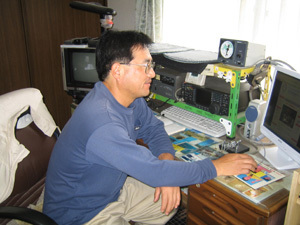 Thanks for a ll the contacts for the 2014 Japan International DX Contest in November. Well my trusty TS950SD auto tuner died. Thanks to JH1BXH Kato san for sending me another one. Thanks its working great. Nov 2, I got XR0YY Easter Island thanks Uruguay DXPedition Group nice job I have 25 states confirmed on 6 meters so far. Here is 2013 Field day 3A station with K6PVC, AK6D, KN6RJ. 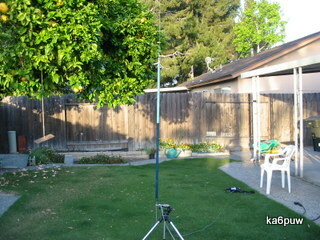 My station is a 2 element 10 meters yagi, 2 element 6 meter yagi and a 2 meter 7 element beam. 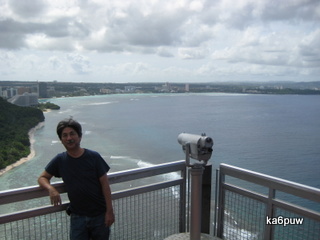 I had a business trip to Guam KH2 and Saipan KH0 from November 24 - Decenber 1. NICE. I worked USA in the morning and EU in the evening. 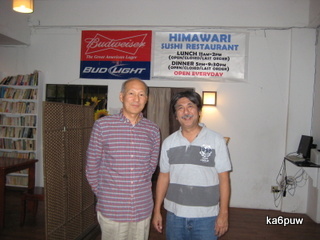 Good to meet JH1BXH from Japan also. 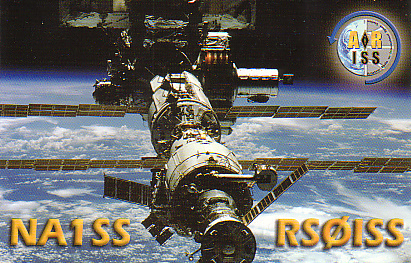 QSL direct pse. 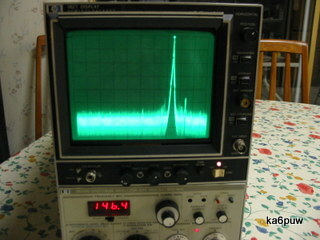 I got a used HP 8558B Spectrum Analyzer. It has some small problems But I think I can repair some of them. Thanks Art AK6D for the gift. 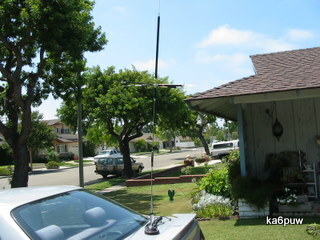 Had a great time in Hemet running 2D station with Ray K6PVC, and Art AK6D. 10m was completely dead. 15m, 20m, and 40m were outstanding. 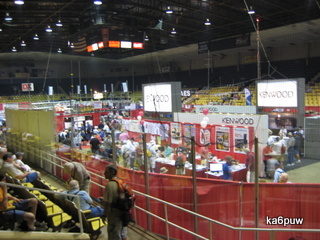 Well I finally made to the Dayton 2012 Hamvention. It was an very interesting event. Sorry not to get any information on new Kenwood TS 990S. Interesting to see it have 2 USB ports on the front panel and apparently has a com port plus a LAN port on the rear. The FSK/PSK button alludes to the TFT main screen will show the decoded text? The rec/play button gives the standard audio voice recording feature on the front panel. I like the ergonomic A/B TX/RX button layout just to the left/right of the tuning knob. I bought a A 61 Webster Band Spanner. 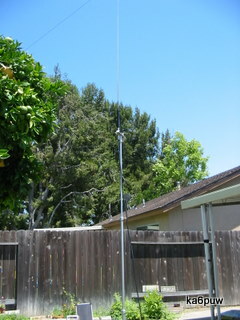 It's a 63"/160cm vertical mobile antenna. I love it because its retro 1960's mobile. The light blue section is spiral wound trap. 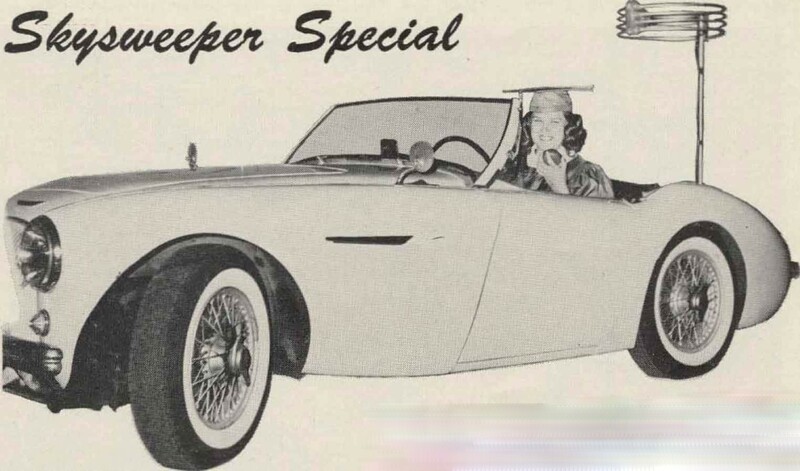 The body is fiberglass. All it's missing is the screwdriver motor from the modern day ATAS/DK3/High Sierra/ type of antenna. The steel whip has marks on it for 10/15/20/40/75 bands. 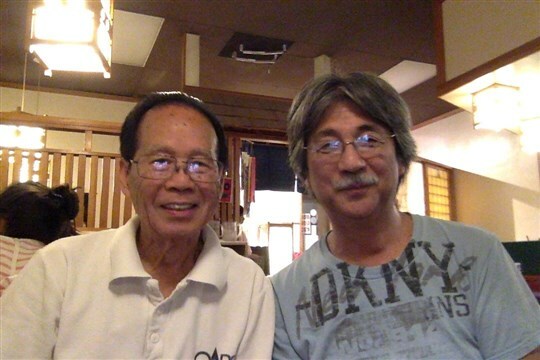 My condolences to the family of JA1QGT/K1QG who passed away in March 2012. 2011--Nice to work DX now for Cycle 24. Some new 6 meters, E51CF, and FK8CP. New DXCC on 10 meters for me SV9CVY, and EU7A. Update: I tested the Maldol QRP AH series antennas. I found a photo light stand made by Lowel. Very light aluminum and extend to 7 feet (2.1m). I thought it would be perfect for the BNC Maldol antennas or for an emergency a 2 meter 1/4 wave antenna. You must have a sandbag weight on it. I was disappointed with the SWR, on the stand AH 28 was around 2:1. AH 21, AH 14 and AH 7 were around 3:1. Was interesting to put the AH 28 and AH 21 directly on the MFJ analyzer and get 1:9 swr. The AH 14 and 7 were over 3.0. I shortened the stinger for 28 mhz to 29 inches and was able to get 1.5 @ 50 ohms 28.425. The AH 21 was 1.7 @ 50 ohms 21.385 at full stinger length. AH 14 swr was 1.6 @ 50 ohms 16.433mhz. I found that a 10' 6" counterpoise gave me a 1:4 @ 14.240. AH-7 is 1.9 @ 50 ohms 8.692mhz. Let me update how long the 7mhz counter poise needs to be. Comet UHV 6: 145.5mhz 1:2/55.20mhz 1:1/28.400 1:6/21.00mhz 1:5/14.125mhz 2.8/6.84 1:1/ 3.45mhz 1:9. 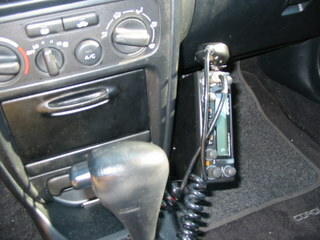 Well I put in a Radio Shack HTX10 (25w) mobile in the car. I used to use my old trusty Uniden HR2510 that had the "Chipswitch" 10m/12m transceiver. The HTX is a little bit smaller. I thought I would try it out this cycle. 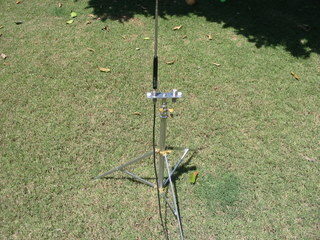 Same antenna as before the K40 CB baseload mobile antenna. Easy to mount, tuff, nice thick steel whip, easy to find replacement parts, and easy to take the antenna off and put it in the trunk. I have had mine for about 20 years no problems. The antenna on the tripod stand is a Comet CHA721. 40 meter and 15 meter trap antenna. 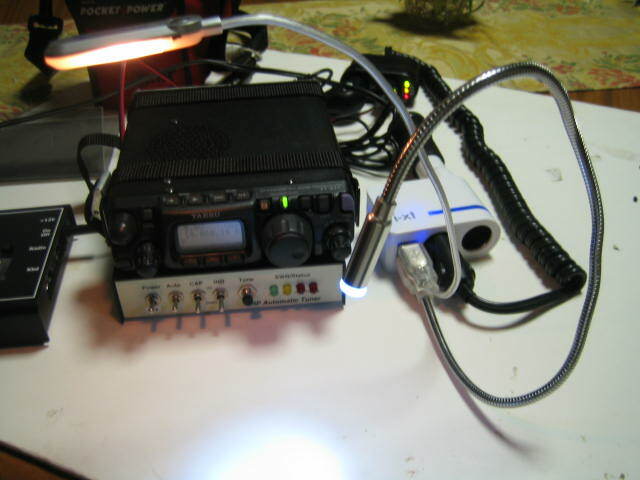 small light and easy to set up for QRP. 7.225 SWR 1.9:1 and 21.210 1.5:1.The base tripod will rise to about 6 feet and is amazingly light. If I had to do HF EMCOM it would be up and running in 20 minutes with no swr adjustment. PSK31 Update:I sent my NUE Digital Modem in for a firmware update. I went from V1.12 to V2.33 for the low fee of $15 USD they did the firmware, hardware mods and testing. I am sure $7.00 of the $15 is for shipping back to you. A quick 2 week turn around and I was back on the air. Great job and thank you Midnight Design Solutions. In the background you can see the Blue Star P1 antenna on the right hand side. You can check out the stand I made under the QRP section. Antennas: I got a Maldol HMC-6S (14/21/28/50/144/440) also not shown I bought a Comet UHV-6. Basically it has the same bands. One small feature is that you can run 40 and 80 meters at the same time. If you choose to run 40m and 80m this will make the antenna really heavy. The HMC-6S you can only have 20 OR 40. I hope to compare them this fall at a campground or park. 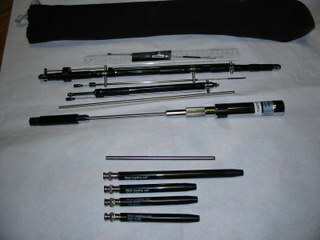 The small antennas in the front are the Maldol AH series. AH7, AH14, AH 21, and the AH 28. I haven't played with them very much and they definitely need a 1/4 wave counterpoise. The Blue Star P1 multiband antenna is rugged and simple to assemble. Tune by sliding the ring up and down. You need to carry a swr meter with you. I tuned 14mhz with a 1/4 wave counterpoise to a very good 1:1.4. You use a standard 3/8-24 mount. Tuning took time with a SWR meter. Get your radio for the band you want and quick tune for highest noise. Fine tune with a swr meter. For quick setup or EMCOMM (emergency communications) I am leaning to a 40/80 dipole. I would like to test the P1 because I have the optional 80 meter coil. Now the 2 mobile HF antennas Comet UHV-6 and Maldol HMC-6S setup is tricky, if you lose the metric set screws. You can substitute M3 x 6 screws out in the field. If its windy, or dark putting in those set screws is impossible. If your running around mobile on the car, the biggest complaint is that the set screws come lose and are hard to find at a hardware store. Don't forget an 8mm wrench, M3 allen tool(1.5 dia), you also need a M2 allen tool (2.0mm)for the Comet UHV 6, and a tape measure. 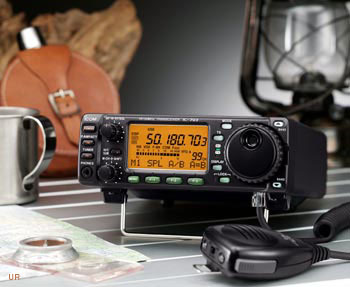 One thing I have not written much about is the ICOM 703+. Its a great radio. It has a larger display and in my opinion its much easier to use.The FT 817 with the LDG QRP Autotuner it little smaller and lighter. The IC703+ can output 10W @13.8vdc and has a autotuner built in. 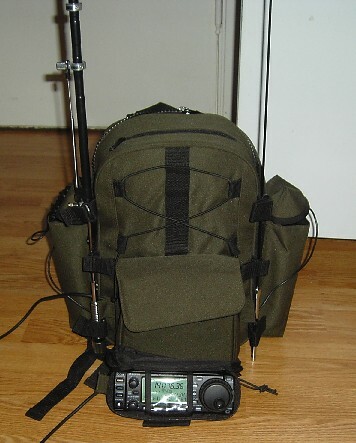 Other high marks are AF DSP, AF speech processing, and removable front control panel so you can belt mount the faceplate and reverse the main body to put on an antenna like the ad picture shows.The optional backpack is too small in size for a adult. The straps cut in to your shoulders. No internal battery. If you use the backpack you can push the battery in the bottom of the backpack. The factory optional 9.6V 2800mah battery is way overpriced. Approx 7hrs operation on 9.6v/2800mah quite reasonable. I am testing a very light 6800mah lion battery. I'll post more info at a later date. Its about 4.3" x 3" x 3/4". Much lighter then the typical 7mah wet cell batteries. It just looks to good to be true. I could not find much feedback on the Icom AH 703 antenna. ($289USD) It very pricey compared to the $100USD I paid for the HMC-6S. 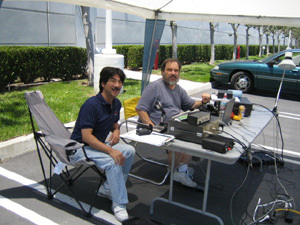 June 25, 2011 Field day Thanks Art AK6D for loaning his QTH near Hemet, California. 40/20/15 were great. March 11, 2011 Tohoku Earthquake My heart felt sympathy to all my 7 area JA ham's I have met. JA7KFB, JA7LER, JA7LGR, JA7LMZ, JA7TQK, JA7QUI, and JF7AWV. 2010-- 10 meter conditions are looking up since 10/14. Nice opening to AF, SA, KH6, NZ, W1-4, Caribbean,and Central America. Hope to work JA's soon. Good to run into an old friend KF7BTV Dean. I found a few good deals. 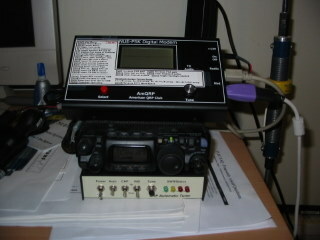 Yaesu FT 817ND, and an ICOM IC 703+. 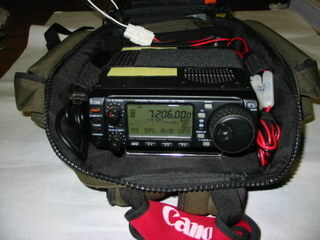 The FT817ND is very handy for testing - I would like to try and use the V/U capabilities it on AO 51. At night I use it to monitor PSK 31 on 14mhz with a another toy NUE PSK31 decoder. Great combo. The IC 703+ is also fun. The DSP functionality and internal auto tuner is a nice feature. 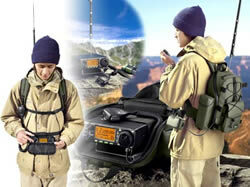 I also got the ICOM backpack with the radio. Kinda small and just fits the radio. I wish it was a tad bit bigger. I had to buy another Control head latch/spring as the original was broken. A call to ICOM parts department was a breeze and I received the parts in the mail in 4 days. Good job ICOM. I ordered the control head cable and control head mounting bracket so you can separate the unit and mount it on the belt. 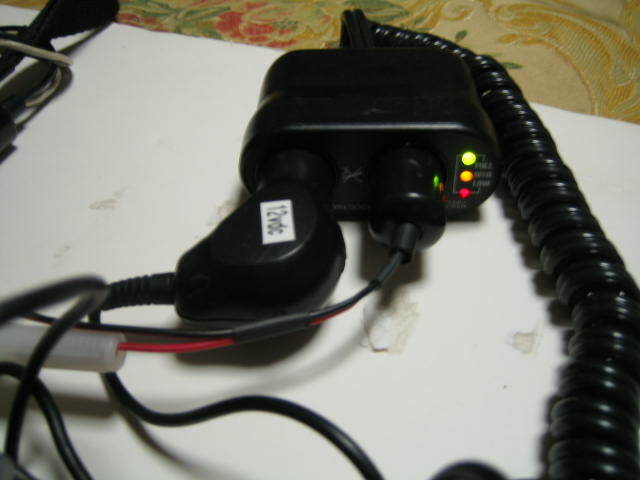 Another plus for me is that the Icom power connector for the radio/battery is used in some of the equipment I service. I can make extra power pigtails for powerpole connectors, cigarette lighter plug, and a 2 pin molex type connector I use. I can also hook up aftermarket 9.6v/12v battery packs. On Ebay they have 9.6/12v Lithium-ion battery for CCTV. They come in a nice plastic case with an on/off switch, connector and charger. 3800 mA battery is $18.00 including shipping. I am interested in trying out one of those batteries instead of the 4amp lead acid one I have. (heavy) I saw on the internet some people using the R/C 9.6v nimh 3800mA types. There are some 14.8v LIPO battery packs for R/C with a $15.00 USD charger. 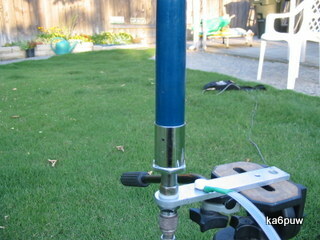 Antenna - right now I am using a Blue Star P1 Portable antenna. 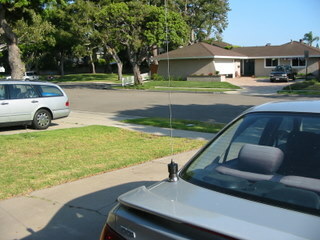 As all types like these QRP antennas they a simple solution to a subject of years of discussion. 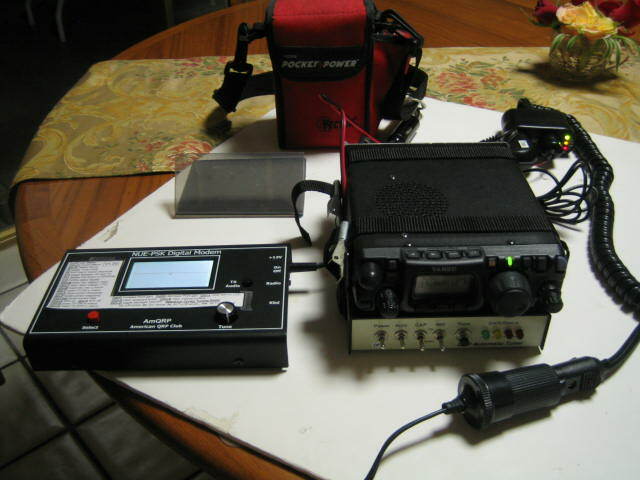 Its great on 20 meters with 1.2 swr and a ground radial. Now on 28,21,17,40 is not so good even with 1/4 wave radials. Best on those bands at 50 ohms is around 2:1. Extending the telescoping whip just seems to change the tuning point on the coil. I have to look into extending the lower rods under the coil for the low bands. This where the FT 817ND is a little bit short with no auto tuner. Which meant I had to look around until I found a good deal on the 30W QRP tuner by LDG for 817. Coupled together they work great. My complaints are that you have to run 3 12vdc connectors, one for the radio one for the tuner and one for the PSK unit. With the battery, tuner, PSK decoder, and radio the package is not so small anymore but tons of fun. Better then dragging out Ol' trusty Kenwood TS 440s and a deep cycle battery. 2009--So far no luck on K5D on 10 meters. Lots of false alarms on the web cluster. 2009-- I'd like to thank AMSAT India for publishing my design and article, "Azimuth/Elevation Rotator for Arrow Satellite Antennas" in their March 2009 newsletter. I got a 6 meter loop antenna on a no bid auction. Was a lot of fun restoring this retro antenna. I buffed the aluminum tubes, added stainless screws and tested the SWR at 50.100. 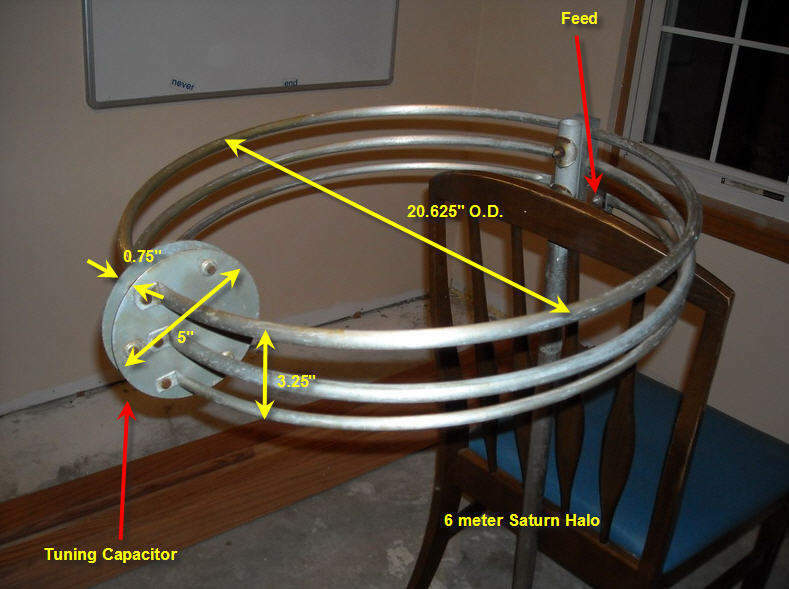 It's almost a perfect match for a Hi-Par Saturn 6 Halo loop antenna except it has 4 loops vs 3. 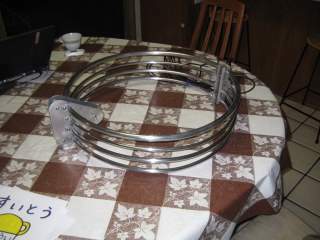 AA9DY was very kind to send me a nice jpeg of his 3 loop Hi-Par Saturn 6 mobile antenna with dimensions. 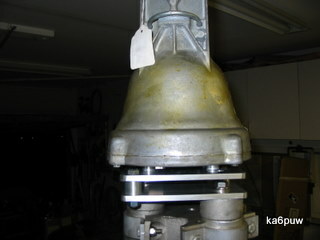 If you have any info on this antenna please drop me a line. My latest project! Well thanks to KE6IDA for finding this telescoping pneumatic mast. It has 3 tubes (it can push up a heavy load-probably a TV microwave dish - no we didn't steal it from a TV news van) It has seven telescoping sections and is around 30ft/9m tall fully expanded. Each section is approximately 4'8"/1.8m. 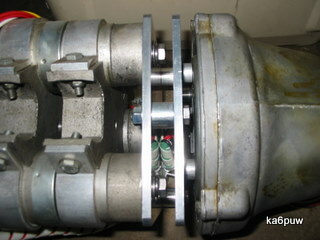 The total weight with rotor is around 120lbs/54 kgs. 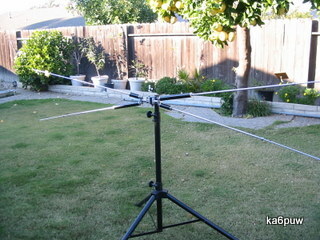 My plans are to run a AR 40 rotor, (its light) and a 3 square foot wind load factor antennas. 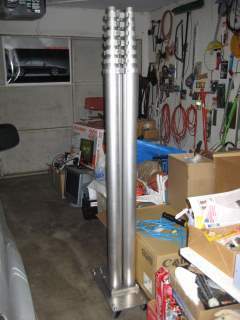 My real hopes were to add a 2 inch square tube on the base so I can put it on a trailer hitch but the pneumatic masts are only supported on to the base with tiny bolts. I would be afraid the vibration from being on a trailer hitch would break the screws off and the leaving a mess on the freeway. Also I need to do some more experiments with a air source. Since there are 3 tubes they take an enormous volume of air to pump them up. Looks like I need a 125 psi 5 gallon air tank. I tried a small emergency 12vdc compressor but it took forever. I wonder how hard it would be to adapt one of those paintball gun air bottles. Cheaper solution might be large PVC pipe like they use for the antenna launchers. 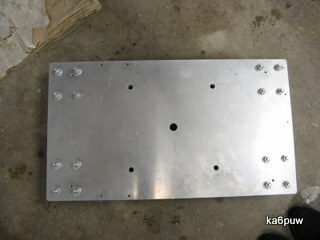 The other pictures show the mounting plates for the rotor and the top of the pneumatic mast. There has to be two plates to clear the rotor wire and the rotor cable screw base which sticks out and is not flat. So between the rotor and the plate are four 1/2" spacers. In between the plates are 3/4" spacers. 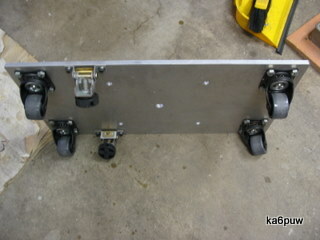 I can take off the rotor without removing the pneumatic mast plate. 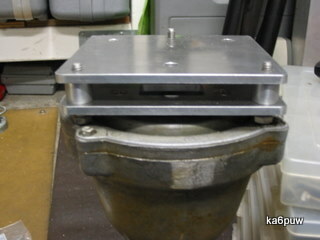 Also I can adapt a different rotor by making another rotor base plate. I recommend a rotor with a flat base like an Alliance HD 73. The rotor wires also come in from the side not the bottom. 2008--Well I actually have some activity this year as Cycle 24 should be starting. This summer I worked some E Skip on 10 and 6 meters. One day it was so good on 10m that JA7OWD made a few contacts with hams in the W7 area. Also I was in JA again on business and was able to meet up with my 10 meters friends. 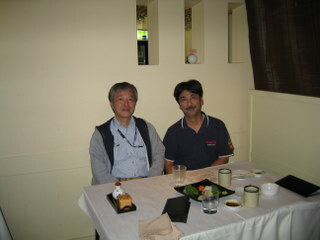 We met at a restaurant in Yokohama. Missing in the picture is JR1MLT/KK4AR and JA1DFZ/W6NEC, thanks for joining us. JR1EYI was here in Los Angeles on a business trip, so it was nice to get together for dinner. 2007--No Activity. Cycle 23 is coming to an end. Kudo's to WH6BIE Kyle for making a contact JA on FO-20. FO-20's foot print barely allows for a 4 minute window that covers part of JA. Morse Code requirement came to and end on February 23, 2007. Starting February 23, all Technicians will have CW privileges on 80, 40, 15 meters and CW, RTTY, data and SSB privileges on 10 meters. 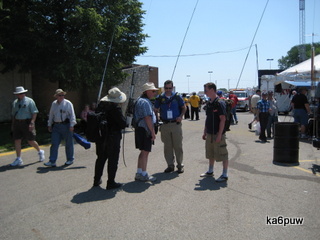 2006--My only activity was Field Day with KD6CML Mike. This was his portable setup. 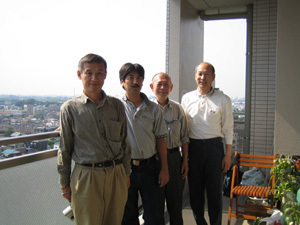 2005-- I was in Japan on business and was able to meet some of my Ham friends. Editor 59 magazine and JA7SN for donating the plaque. 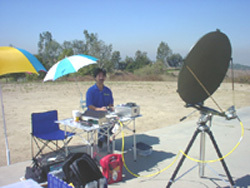 Mitaka Tokyo at JH1BXH's QTH. 2004-- Well not much to report this year so far. 10 meter dx conditions are poor to none. Sorry to see the YV0 DX pedition go QRT early. A040 is dead. I would like to thank all the JA's for the 2003 JIDX contacts on 10 meters. 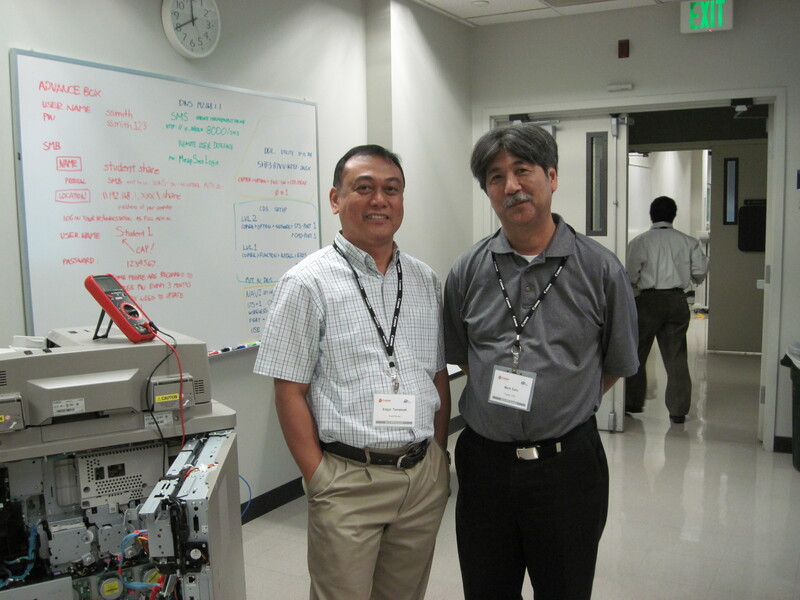 I received First Place North America 28 mhz Top. 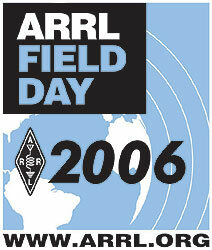 For 2004 JIDX I was quite surprized to make 10 contacts on 28mhz. Thanks again everyone. 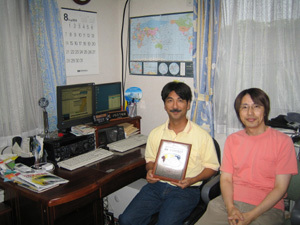 Plaque donated by Hiroaki Kanamori JA7SN Morioka Contest & DX Association Thanks ! 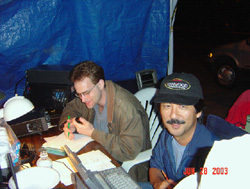 2003-- I have been QRT since January because of heavy work schedule. I did tilt my tower over to replace the coax and do some maintainance. I also took my satellite antennas down to redo them also. I got First Place for the 2002 JIDX 28 mhz Low Power #1 North America. 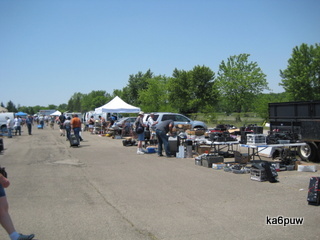 Thanks everyone for your support.Picture on the right is the SCJHC ARRL Field Day. Operator on the left Kyle Pearsall KG6FEM. 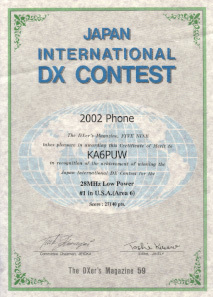 2002-- Well I worked PW0T, TI9M, K1B, C98DC, EW8AF, and heard the YI pileup on 9/28/02. 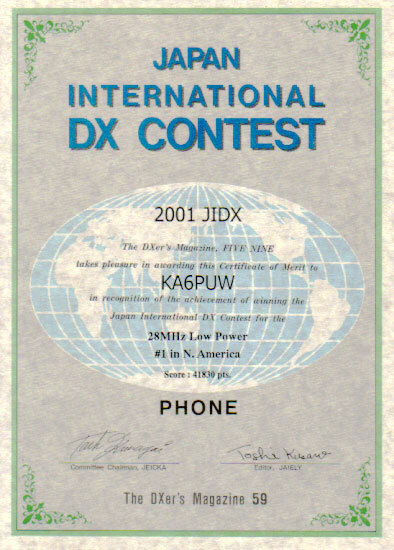 I got #1 NA 28mhz Low Power & World Top 28mhz Low Power for the 2001 Japan International DX contest last November. 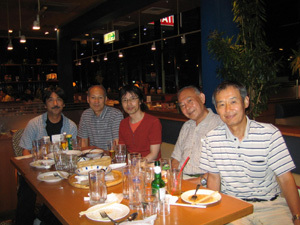 Thanks for all the contacts this year for the 2002 JIDX contest. I made my first AO-40 QSO with WA4YRJ in Knotsville TN. Plaque donated by JH3GRE Junichi Nakamura thanks! 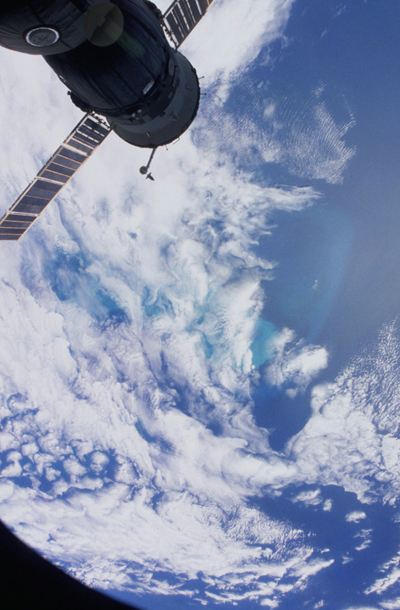 2001-- Started up with satellites again. I'm active on FO-29. I'm only using a 7 element vertically polarized beam and a 10 element 440 beam also vertically polarized. I put up a 2'x3' BBQ type 2.4 ghz dish to hear the A0-40 downlink. I'm using a modified Drake 2880 downconverter. My thanks to K6VLM for the use of his HP signal generator and KE6IDA for his expertise in the Drake modification procedure. 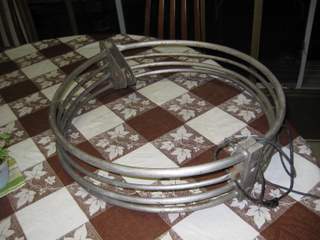 Next project is to move up to a 3 foot BBQ type dish and a helix feed. Hope to hear you on the birds soon. Great 6M opening on November 18. Worked 28 JA's! 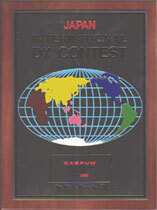 Thanks everyone for all the contacts for the Japan International DX contest. 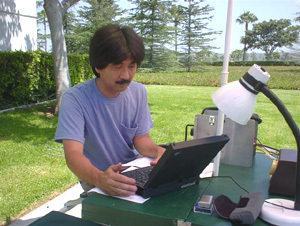 About the same score as last year..Picture on the right is the ARRL 10ghz microwave contest. 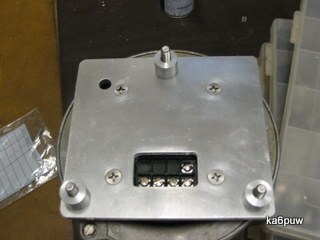 10ghz ssb homebrew unit made by KE6IDA. Worked some new DX on 10m: 3Y0C, VK9ML, AP2IA, ZK1TUG. Drop me a line. Questions, comments or suggestions welcomed! Thanks for stopping by. Last update: 03-01-18.